The Burleson Files | Understanding Your Customers. 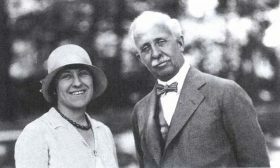 Born on a Missouri farm in 1875, James Cash Penney started in the retail business in 1898 as a store clerk in Colorado. He quickly moved up the ranks and in 1902, he was offered a partnership in the Golden Rule store. He soon bought the entire operation and by 1914 he moved the company headquarters to New York City and had built the largest department-store chain in the United States by 1917. At the age of 41, a life-insurance company said his overwork made him an at-risk client. So, he stepped down as president of his company and traveled the country, helping farmers and small store managers in the rural towns where most of his JC Penney stores were located. He rarely gave advanced notice that he would be visiting one of his stores. He would just walk in and startle managers and customers alike. His personal interactions improved the morale of the employees and the customers. More importantly, he came to understand the needs of the people who lived in the towns supporting his stores. I often listen to clients tell me about their plans to “completely exit” the business. Many of them came up with the idea after listening to one of my lectures or meeting one of my clients who has achieved the elusive status of being able to “work on the business, not just in the business.” I always warn them. Although you can exit the clinical delivery of care and hire associates and talented managers to cover the day-to-day operations of your practice, you can’t really ever leave the business. Not if you want it to consistently represent the core values you’ve established in the practice. Instead of working so hard to get out of the business, find new ways that you can contribute your highest talents to the company. In this way, you’ll motivate your employees and delight your customers, as your practice delivers more value than any other office in town. You’ll be better aligned with the needs of your market and better equipped to meet those needs.Then, find what makes you tick and commit to doing it for the rest of your life. For JC Penney, it was constant interaction with his customers and managers, even though he wasn’t running the day-to-day operations. At the age of 95, he was still catching the bus to his office, enthusiastic to share with the leadership at his company what he had learned on his last trip. He refused the limousine that the company offered, because “that wasn’t the way JC Penney traveled.” He had a deep understanding of his customers in small towns. They didn’t take limos to work, so he didn’t either. His curiosity and understanding of his customer base allowed him to build over 1,500 outlets by the early 1930s. His competitors rarely left New York and almost never sat face-to-face with customers in an attempt to understand how to make their lives better. What do you know about your patients that no one else in your market understands? Patients will tell you everything they need from you, if you’ll take the time to visit with and listen to them.